Sistine Chapel and Vatican Museum, Vatican City. We were determined to visit the Sistine Chapel, and it took us three attempts before we managed it. The first day we went the queue was 1km long and not moving, the second time we tried was on the Sunday and it turns out it's closed on Sundays, so we tried again on our last day - the Monday, and after two hours of queuing from 7:30am, we finally got in. Word of advice: book online at least two days before you go so you don't have to queue! Sadly, after all that queuing and so much expectation, I was sorely disappointed. I don't think it helped that it was so busy in there I felt really sick, instead of being able to wander around freely to stare up in wonder at the enormous fresco by Michelangelo, we were crowded in like cattle, being constantly moved on by security and getting shouted at by them if you even dared stop and look up. This is a chapel, a place of worship, and yet we were being treated like animals who had no right to look at these works of art. The guards made us feel as though we didn't deserve to be there, and it just made me want to get out of there as soon as possible. As a Catholic I think it's really sad that I didn't feel welcome somewhere where I should have. After three days of attempting to see the Sistine Chapel, moments after I entered I just wanted to leave. Anyway, the Vatican Museum itself was really overwhelming, there is so much 'stuff' it's insane. So many sculptures, so many works of art, and money. No wonder the church is so wealthy with the amount of art in the Vatican alone, originals by Matisse, Da Vinci, Dali, and Raphael amongst others. 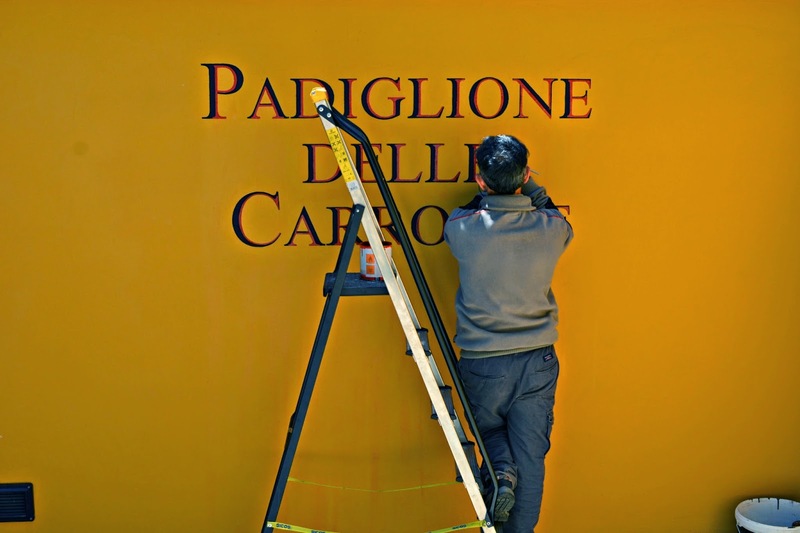 And with them charging 16 euros per person for entry to the museum, and with 20,000 visitors per day, they're earning almost 1billion euros a year just from entry fees to the Vatican. It made me feel slightly sick working this out. 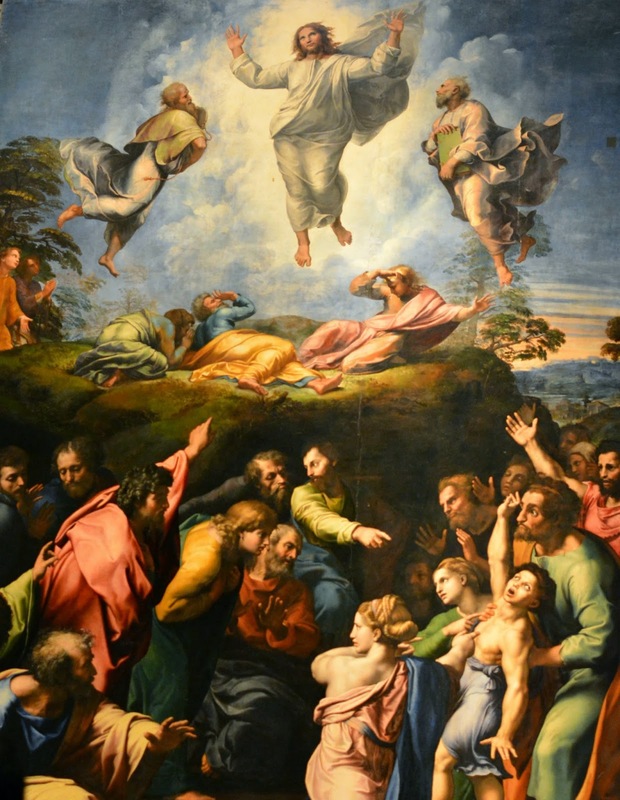 The above is Raphael's Transfiguration, a huge painting that has the most incredible use of colour. It was when taking this photograph that I fully came to appreciate my D5200, the light was so dark I could barely see it with my own eyes, but the camera managed to capture the colours magnificently. 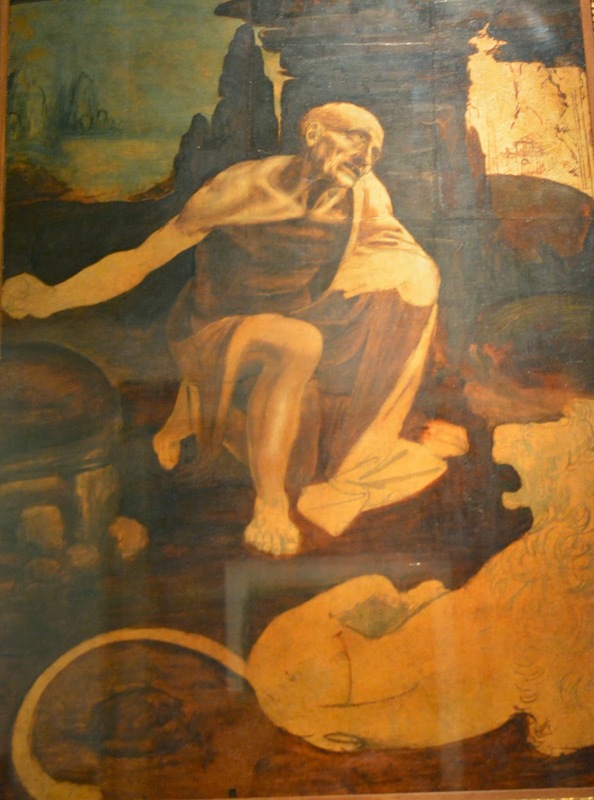 The below is Leonardo Da Vinci's St Jerome in the Wilderness, it is an unfinished painting by Da Vinci from 1480. The museum is well worth visiting, especially if you're a fan of renaissance art. But again, be prepared for thousands of tourists and large crowds. There's a cafe inside that has awfully rude staff but decent cakes, and there's also a garden area you can wander around and the carriage house; if you go down some stairs in the garden you get to a museum which contains all of the Pope's carriages since the 1700's. There's also the more recent cars, or 'Popemobiles' including the one John Paul II was in when he was shot. After the museum and chapel we then went for lunch before heading back to the hotel to get our taxi to the airport. 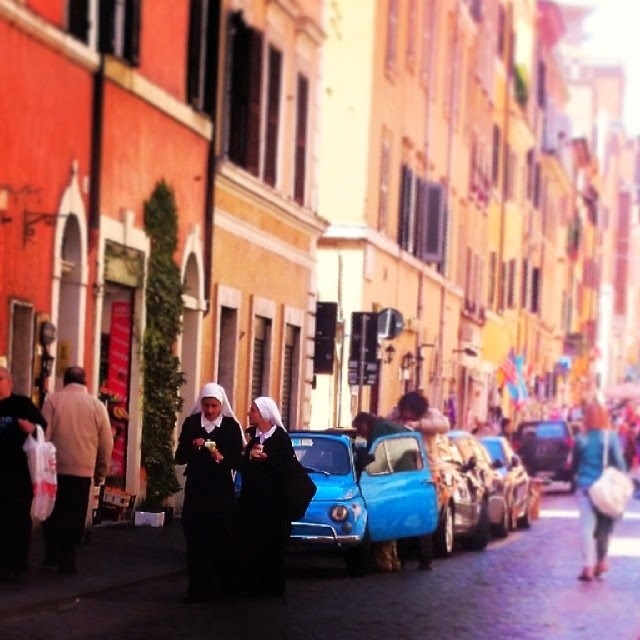 Lunch consisted of pizza and people-watching, where we spotted two nuns and an old Fiat 500 in the street - stereotypical Rome. I enjoyed our weekend in Rome, the history is fascinating and it feels as though you've been swept back in time - there's barely a modern building in sight! But I'm not sure I'd go back (next time I'd love to visit the southern coast of Italy), I just couldn't stand the crowds of people everywhere we went, the street sellers everywhere we turned, and the food was sadly not that great. Despite us taking advice and going to restaurants on the backstreets, I only had one meal there that I thought was really exceptional. They did however, have the best Gelato I've ever had, I'll give them that ;) If you go to Rome, you must go to Giolitti near the Pantheon, it was simply amazing. 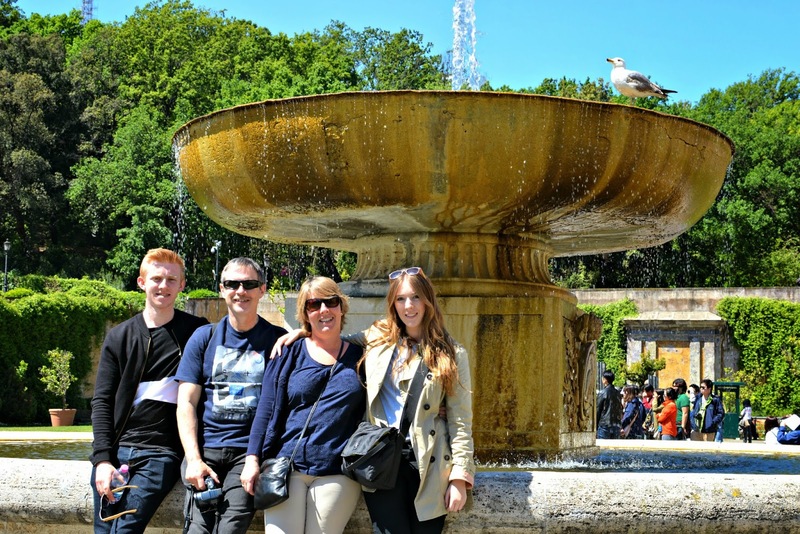 It's the oldest ice-cream parlour in Rome, and the gelato was definitely the best we had while in Italy. 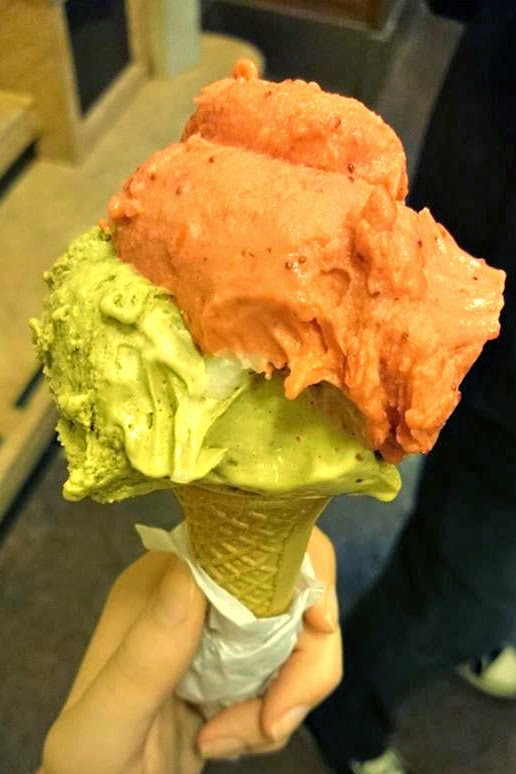 I had Pistachio and Strawberry - weird mix, but it went surprisingly well!